It’s easy to see why peer-to-peer fundraising is so powerful. By allowing your supporters to create personal fundraising pages, you empower them to not just donate, but raise money on your organization’s behalf. Because your fundraisers are the ones doing the asking, you want to make it easy for them to create and run their personal campaigns. The easier it is for them to fundraise, the likelier they are to do it. It’s up to your organization to streamline the fundraising process for your supporters. You can accomplish this with the right software. Here are three ways that Classy can simplify the fundraising experience and empower your most dedicated supporters. With 80 percent of people using their smartphone to go online, it’s clear you need to optimize the mobile experience for your supporters. This goes not only for your donors, but for your fundraisers as well. When fundraisers are able to manage their personal campaigns from their phones, you increase their chances of logging in and keeping up solid fundraising efforts while they’re on the go. With Classy, you’re able to keep your smartphone-using fundraisers dialed into their personal campaigns no matter where they are. 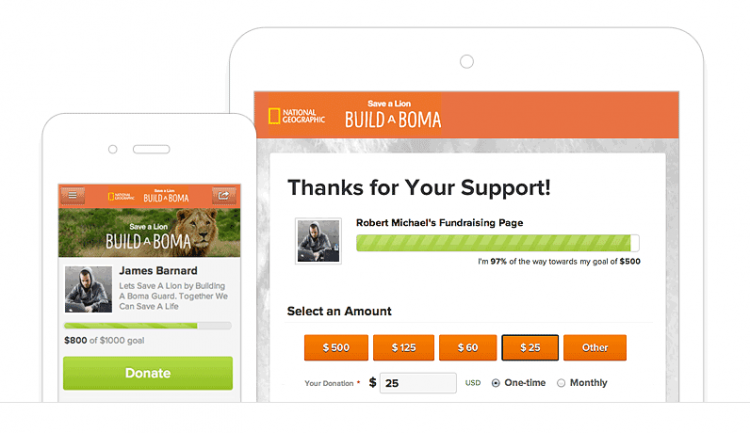 They can create and edit their fundraising pages entirely on their smartphones or tablets. Instead of having to save images to their desktop in order to upload them, they can quickly post photos to their pages straight from their phones. They can share their pages to social media, comment on their activity walls, and email donors a thank-you, all from their handheld device. Make the fundraising experience a mobile one, and you’ll make it easier and quicker for fundraisers to keep a pulse on their pages. Nonprofits know that a critical part of fundraising is engaging and thanking donors. Your results hinge on whether you effectively spread the word, keep supporters engaged, and thank them for their contributions. Likewise, your fundraisers’ success depends on how well they communicate with their networks. It’s your job to provide them the tips and tools to accomplish this. Email is one of the main ways they will reach out to friends and family. With the right software, you can simplify this emailing process. Instead of having to log out of their page and log into their email account, Classy enables fundraisers to email donors straight from the backend of their fundraising page. 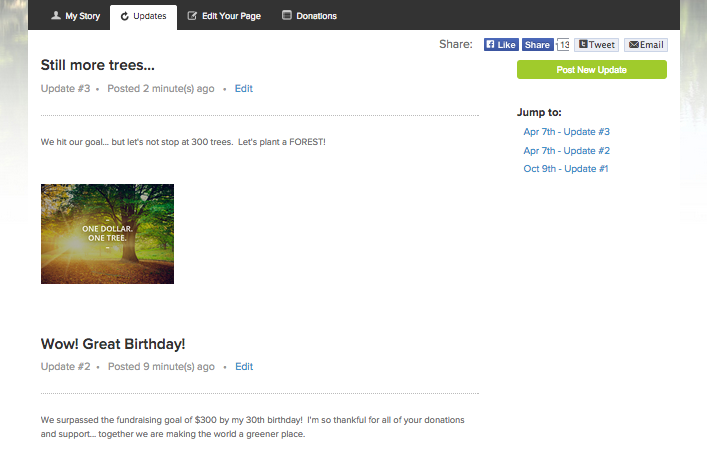 When someone donates to their page, an option appears next to the gift for fundraisers to send the donor a message. Individuals can email a personalized thank-you immediately. On top of simplifying the email process, there are other ways you can empower fundraisers to sustain frequent communication with their donors. One option, for instance, is to turn their fundraising page into a place where they can update donors about their progress. In addition to the main content fundraisers can add to their page, the “Updates” section on a Classy fundraising page serves as extra, custom real estate where fundraisers can keep supporters up to date on the campaign’s progress. This is also a place where fundraisers can add extra personal photos, beyond the five pieces of content displayed on the media section of their page. 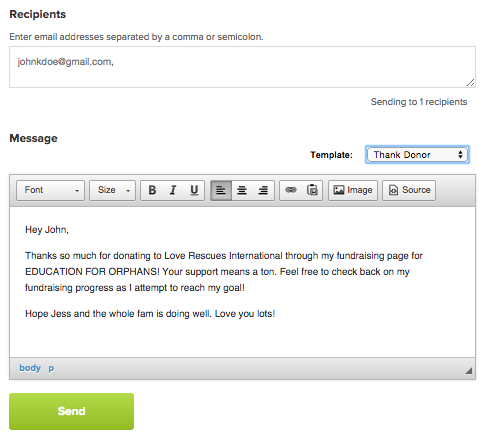 When they post an update, fundraisers can send an email notification of the update to all of their donors. This enables them to keep supporters up to speed on both their page and through email, all in one step. By providing this option, you empower fundraisers to communicate consistently (and easily) with their donor base—a key component of fundraising success. Providing fundraisers with the right tips and tools works to your organization’s advantage. When you make it easy for committed supporters to create and manage their own fundraising page, they are more inclined to raise money on your nonprofit’s behalf. This, in turn, can drastically affect your organization’s fundraising results.